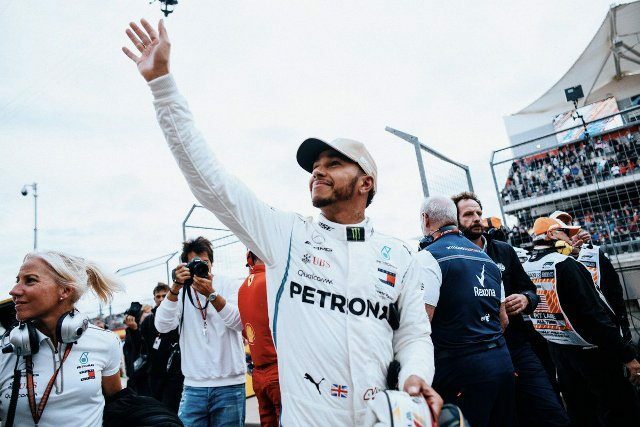 Lewis Hamilton of Mercedes moved closer to his fifth Formula One title as he took the top position in the United States Grand Prix on Saturday. The British racer proved to be the fastest on the Circuit of the Americas as he completed the lap in 1:32.237 minutes. Sebastian Vettel of Ferrari qualified at second position with a time of 1:32.298 minutes while his team mate Kimi Raikkonen took the third position with a time of 1:32.307 minutes. Mercedes’ Valtteri Bottas was the fourth-quickest in the session with a time of 1:32.616 minutes. Fifth position was taken by Daniel Ricciardo of Red Bull Racing as he qualified in 1:33.494 minutes. Hamilton will win his fifth title if he scores nine points in the race.